You may remember my post from last year lamenting who was voted as winner in the finale of the first season of King of the Nerds, because, you know, she was not really the nerdiest of them all. But I digress. We're moving on, now, to a whole new season of fun and awkward. Because let's just get this out of the way now - nerds are awkward, normally because of social skills not exactly being top notch. I'm not trying to take a dig right now; I think most nerds would agree. From Pokemon masters to Japanophiles to Gaymers, we've got a whole host of new contestants. Anyway, there are new contestants, and I feel like I can't really comment much on what's going on yet because it's the very first episode, but I will say I feel kind of bad for Kelsey for being the first to go home because she happened to be one of the more socially awkward people there, and was probably not envisioned to be a very strong ally to some of the people around. In fact, she was the one not chosen for a team right from the start. Of course, she ended up getting on a team anyway in a bit of reversal trickery that nearly involved someone going home before any contests even happened, but ANYway, she DID make it on to a team, only to be the team's first choice to send to the nerd off. Sheesh. 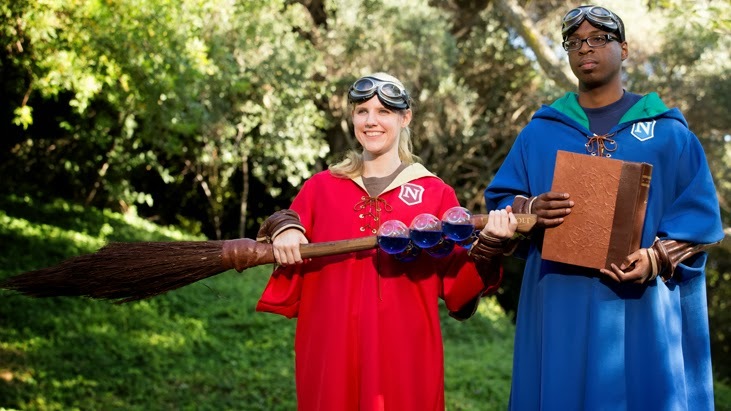 Kelsey and Chris are the first two to face off in a Quidditch-inspired duel. Chris does not look pleased. To be honest, Kelsey should've won that game if it were based on fantasy knowledge merits alone. But, alas, the competition merely went on to show that hand-eye coordination is somehow equally important in this thing, even though it's pretty established that nerds get picked last in such competitions. The whole gym class thing, you know? So Chris ended up winning just because he was able to get a ball of "potion" into a cauldron worth more points than Kelsey, even though she got more questions right. I suppose this is the same as last year, and they make it out to be some kind of recognizing relative space and arcs and when is the right time to throw based on knowledge, but.... sometimes it just comes down to hand-eye coordination. I'm sorry, I'm rambling a little bit. The truth is, I really like this show. The people on it are much more interesting than those on some other reality competitions. They genuinely care about each other (usually) and are truly excited to be part of the whole Nerdvana experience. It's hard to say off the bat who I'm routing for and who I think is going to win, but I will say one of the nicer people on the show so far seems to be our resident Gay Gamer (aka Gaymer) Xander. I will say I think maybe Kayla could be a dark horse, and that while Nicole and Zachary already have an alliance, they seem like they could become drunk with power and lose it. That's all for now. Not sure if I'm going to do actual weekly recaps of this show. Would you guys like that, or just like me to check in every now and then? Let me know and vote below! Weekly recaps or various check ins?